This is a trend which started to really gather speed towards autumn last year, but now it’s getting all polished up and gleaming for summer. 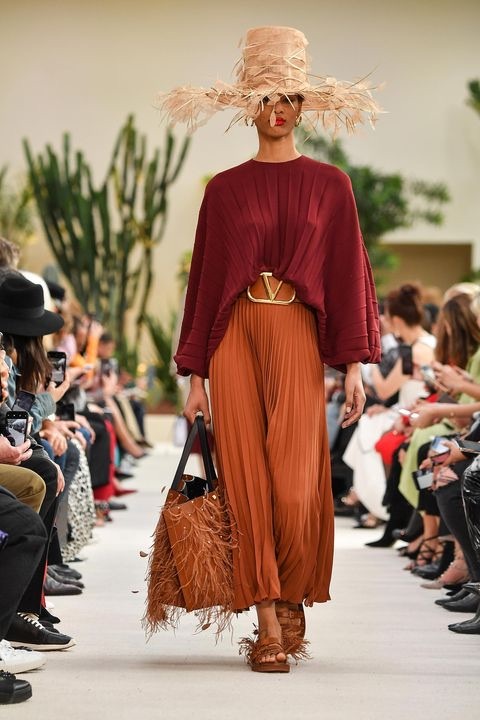 We're seeing desert tones in brighter versions of the earthy palettes seen at play in seasons past - not regular old rust but sunshine orange, not plain burgundy but jewel-red, put together with terracottas, blanched browns and dandelion yellows. Roksanda, Tibi and Valentino are your go-to references of the moment, as even maxi skirts and sweaters look so exotic they're off the colour charts. Wear them in single tonal looks or contrast them by colour-blocking separates, for equal impact whatever occasion you're turning up the heat for. This infusion of scorching shades will put us in mind of sunkissed strolls along far flung shorelines and hazy evenings enjoying colourful cocktails. And, hey, even long weekends in the great British beer garden if our summer turns out as utterly bloody brilliant as the one fondly remembered from 2018. I am absolutely here for the prairie trend, purely because any kind of dress-up vibe which instantly puts you into another time period just epitomises what fashion should be for me. That is, fun, transformative, lifting any day out of the ordinary and straight into the boundless depths of your imagination. The pieces seen in current designer collections (Coach and Batsheva are key purveyors) are extra-long, extra-high, extra-modest and extra-vintage; the latter of which will probably be stated on my headstone that I am all about. They feel very right for the changing season, when my and many other gals' aesthetics naturally start to incorporate more feminine looks. Despite its ultra-conservative form, the prairie dress has been dubbed by the Washington Times as "the most provocative thing in fashion." I can completely see why, in an age of trainers as clubwear and tracksuit bottoms as office attire. Athleisure can't be the be all and end all, as much as everyone may love to don the guise of health freak now (although they do both adhere to what's been dubbed the antisexy movement). I am also a big fan of a Western reference; cowboy boots would give these dresses a great stompy feel which balances out stuffiness, though I think pairing them with an extra-high platform heel would also make for perfect unexpected partywear. Give me a frilly hem on a dramatic gown as daywear anytime though; I might leave the bonnets to Jemima Puddle-Duck for now. As someone who likes to think of themselves as a part-time maximalist (come on, it’s not always practical for your day-to-day if you aren’t Leandra Medine or Iris Apfel); neon is a beast I am naturally drawn to. I think I’ve mentioned before how I once simultaneously wore highlighter shades of pink, lime and electric blue all in one gloriously migraine-inducing outfit; and no, I’m still not willing to share the photo evidence. There has been a smattering of such shades on various it-jumpers touted by bloggers aplenty this season, so I’m excited to see the more glamorous and formal iteration of the trend on striking evening dresses throughout summer’s calendar of weddings, garden parties and gallery openings we’re all sure to be attending (okay, our mate’s birthday pub crawl and potentially bottomless brunch the next morning, if we want to get really fancy). House of Holland, Emilia Wickstead and even Emporio Armani sent models down the catwalks in glorious fluorescent concoctions, so whatever you do - don't be left in the dark when it comes to acid brights. Oversized accessories are a trend I’m really excited about; quite simply because it scares me (I'm such an adrenaline junkie). There aren’t many trends I’ll say that about, save for kitten heels (which, unthinkably, I warmed to for the first time in my life this year - the gorgeous In the Frow is making them look so wearable at the moment). 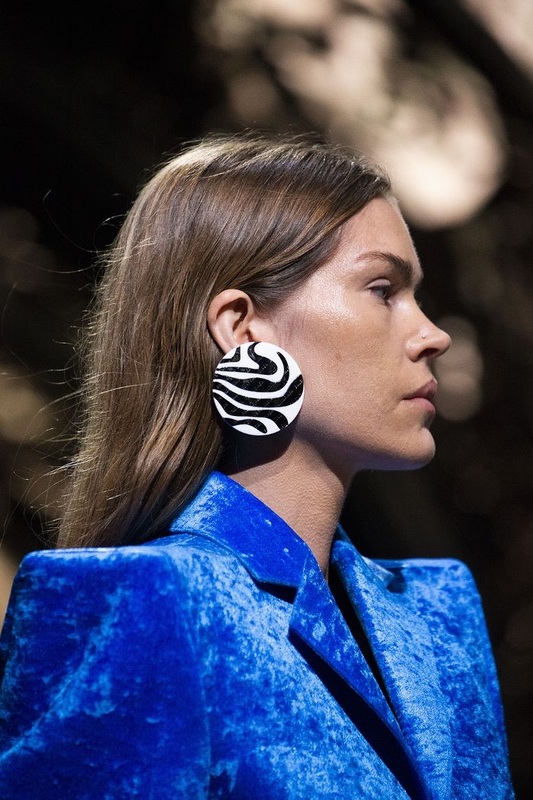 I'm uncharacteristically nervous of this trend specifically when it comes to the earrings. I have bought innumerable ginormous plastic or jangly ear baubles over the years and been too chicken to do anything with them, besides let them gather dust (I think I always feel I need bigger hair maybe?). This year though, we’re going to see everything from jewellery to hats to bags to shoe soles go XXL: see Maison Margiela's handbags and satchels, Miu Miu's platform heels, Loewe's sunglasses and Prada's headbands. Hey, better to be intimidated by a season’s offering than bored, I say. Bring on the dramz. Another trend I’ve always longed to adopt, but haven’t really got into yet - not because I’m afraid of whether I can carry it off this time, as I think tuxedos are definitely universally flattering. With this one, it’s more that I always had perhaps the misplaced idea that good tailoring requires some investment. 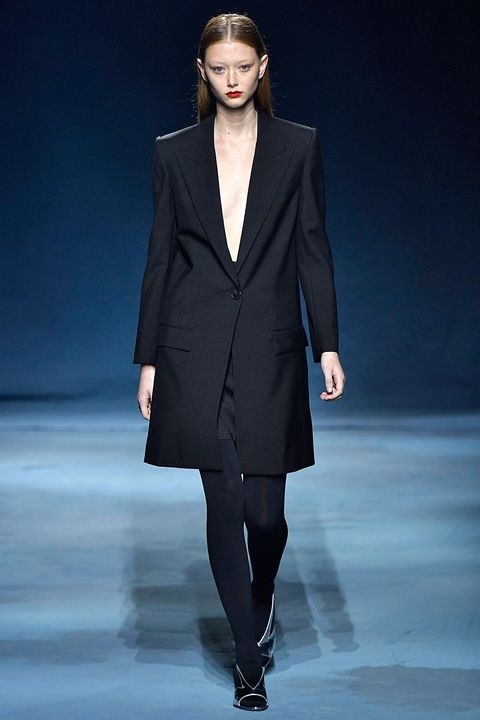 I think it is true though, that over the last year or so the evening suit has definitely become much more accessible for women. 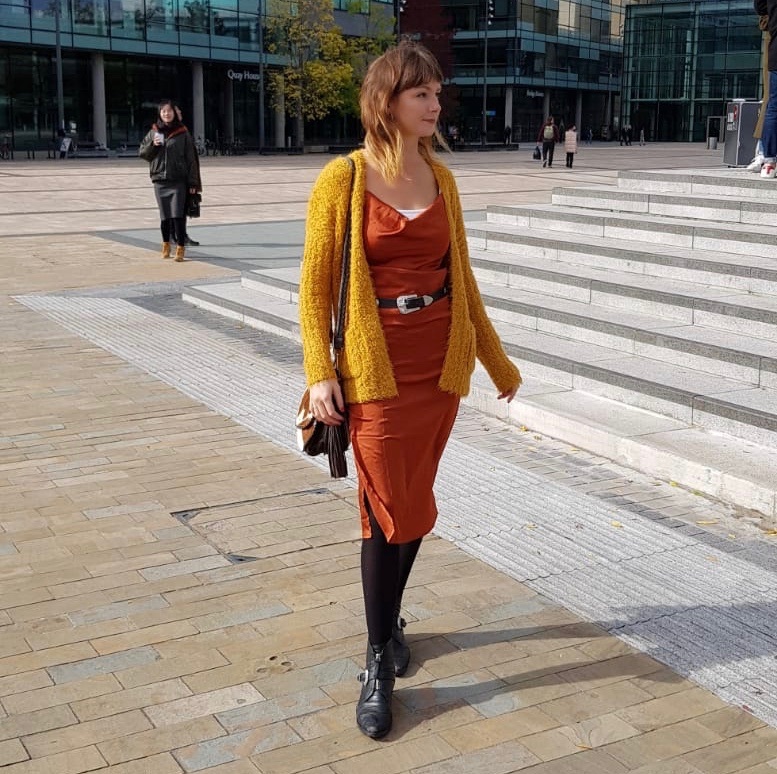 There seems to be an assortment of great styles on the high street for an affordable price now, and this is the year I’m going to go for it with the style inspo of bloggers such as Megan Ellaby, who’s always known how to work a suit. In the SS19 shows, Giambattista Valli, Alexander McQueen and Hermès all showcased various interpretations of the striking tailoring we once thought only Diane Keaton could pull off. The democratising of what we would have formerly referred to as masculine styles in women's fashion, or as androgynous when Hedi Slimane became the go-to name in female tailoring, has definitely been helped quickly along by increased conversations around gender identity over the last year or two. Which trends are you looking forward to wearing this year?